There are only a few holy tenets that all black boys must know by a certain age. One is learning how to tie a durag properly so that you don’t have lines embedded in your waves. Another is learning how to properly care for your sneakers. Arguably the top of this list would be dap; all black boys of a certain age must learn how to properly greet another black man. History dates dap back to biblical times in which Ham, a black man, greeted Jesus, another black man, one day while shopping at the Bethlehem Mall in Bankhead, Jerusalem, for some new sandals. The two gave nodded heads and exchanged a handshake that was later described by a white scribe as an informal greeting amongst brothers. Cave drawings found by old white men show two cave scrawls smacking five and embracing each other in a half hug. So The Root’s “Dap Analysis Pack,” also know as D.A.P, decided to break the footage down to really sus out exactly what went wrong. Below is footage of the moment that Sen. Cory Booker (D-N.J.) and CNN host Don Lemon ruined 5,000 years of black male history. Staff Writer and Senior Wypipo Correspondent Michael Harriot: “They were both in the green room warming up, because they only give dap once every other year. They were probably shadow-dapping; nervous about how it would look. I bet they dap in the mirror. But where they fucked it up is not having a-dap-ability. Both went in up high for the dap, because that’s how they read about it in DAPIpedia. But Even Michelle Obama knows, ‘when they go low, you go high.’ But the worst part was the dap dismount. They didn’t make it snap or ANYTHING. Booker almost fell out of his damn chair. VSB’s Panama Jackson: “How a black man from Baton Rouge and one from Newark don’t know how to dap publicly is enraging, and as a light-skinned man, I’m disappointed and sad. I feel like they both started out thinking they’d do the respectability politics route but both changed midstream and they couldn’t recover. They both thought about it through the entire interview. Guaranteed. Obama would never. D.A.P found photographic evidence that Booker knows how to shake hands as a black man. Below is an image taken Feb. 24, 2019. We have no proof as to whether or not this photo was staged. Cory Booker (D-NJ) (R) greets a person who asked a question during Booker’s ‘Conversation with Cory’ campaign event at the Nevada Partners Event Center on February 24, 2019 in North Las Vegas, Nevada. 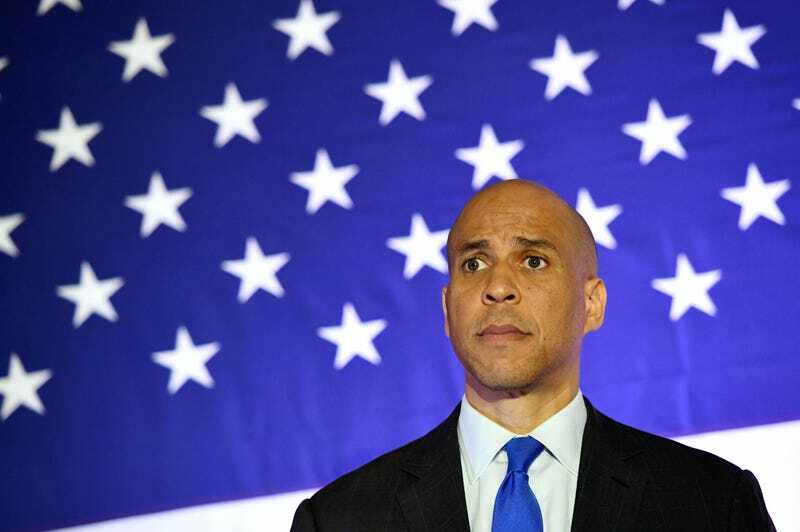 Booker is campaigning for the 2020 Democratic nomination for president. D.A.P. was unable to find any proof that Don Lemon was not responsible for this goofed-up, black man handshake.